In 1974 some farmers from Xi’an (in Shaanxi province, China) uncovered ancient statues of soldiers made out of terracotta. Each soldier was individual in height and facial features suggesting they were modeled on real people and not just made from a caste. Archaeologists would go on to discover that buried in the same area was a terracotta replica of an entire ancient Chinese army including horses and chariots and cavalry regiments. What these farmers had stumbled upon was not merely an exquisite replica army, but the outer part of an entire necropolis centered around a central tomb. 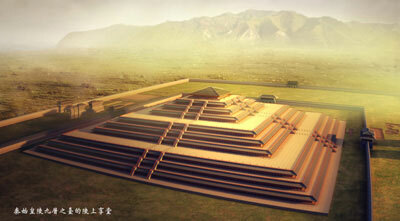 The tomb – as yet unopened and unrobbed – was the burial place of China’s first Emperor, Qin Shi Huang (pronounced chin shu huang). Born in 259 BC, Qin Shi Huang was born into the royal family of the kingdom of Qin (from where we get the name China), one of six kingdoms in what we now call China. He would unify China in 221 BC and rule for nine years before meeting his untimely death, a death of his own making. Each kingdom was as separate in language and culture as the states of Europe are today yet by the time of Shi Huang’s death he had created a uniform Chinese identity, harmonizing language and writing and increased the speed of travel through creation of an Imperial road network. Shi Huang also sought to protect his Empire from the barbarian tribes in the north by building the Great Wall (this was an earlier version of the Great Wall that is now so famous but it can still be seen in certain places). However, in his bid to unify China Shi Huang also committed despotic atrocities. The policy was to be known as fén​shū​kēng​rú (焚书坑儒) which literally translates as the “burning of books and burying (alive) of scholars”. This policy was intended to create a state approved version of “the truth” in everything but especially history. Hundreds of scholars were killed and countless books were destroyed leading to an incalculable loss of history and knowledge for the Chinese people. Shi Huang was obsessed with his own mortality and sought to find the elixir of immortality. Some of the scholars who were killed during his reign were apparently alchemists who failed in their appointed task. At some point he sent a man from the Zhifu Islands called Xu Fu to find a mystical 1000 year old man called Anqi Sheng, said to inhabit the legendary Penglai Mountain (possibly Mount Fuji in Japan). Xu Fu was given a task-force of 60 barques and 8000 crew members. Knowing that they would be killed if they failed to find the elixir legend says that Xu Fu simply fled and went to a foreign land and declared himself a king (there are many theories to say that Xu Fu colonized Japan). Whilst this was going on Shi Huang had been advised by his alchemists that mercury could prolong life although not lengthen it indefinitely. The Chinese believed that mercury held mystical qualities as it is the only liquid capable of dissolving gold. The Emperor was put on a course of taking pills of mercury believing that his life would be extended until Xu Fu returned with the secret of immortality. These pills caused the Emperor to slowly go mad before dying in 210 BC at the age of 49. His long-time Prime Minister, Li Si, feared chaos would follow the Emperor’s death and so disguised the dead Emperor in order to fool his servants into thinking he was only sleeping. Li Si arranged for Shi Huang’s younger son Huhai to become Emperor but this reign would be short and chaotic as uprisings toppled the Qin dynasty. China, however, would remain a single entity right up into the modern era. Shi Huang was buried in his mausoleum which had been under construction since before his unification of China. 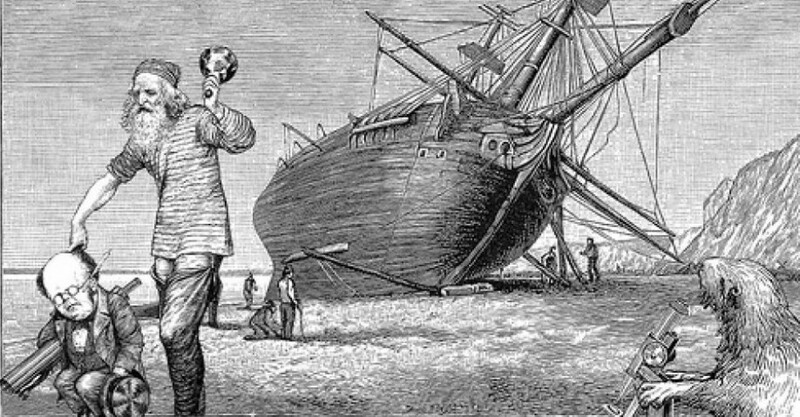 The colossal project was laboured on by 800,000 workers according to the contemporary historian Sima Qian (British historian John Man disputes this figure and claims only 16,000 would have been sufficient). The Mausoleum was, in essence, a city for the Emperor to rule in death. The size of the site is a vast 170,000 square meters. It is a city surrounding a huge earth mound buried underneath which is the tomb itself. The area was guarded by the terracotta army who would protect the Emperor in the afterlife. The mound covers the original structure of the tomb which was a step pyramid, roughly 70 meters high. Inside the tomb Sima Qian describes a series of crossbow based traps to kill any intruders. It is the central burial chamber which sounds like one of the greatest human creations. The Emperor lies in the center of the chamber. 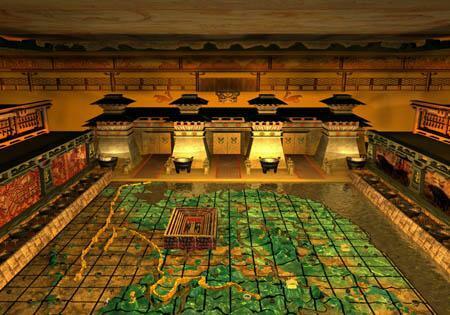 The floor of the chamber is described as a map of China with the rivers and sea flowing with mercury (ironically the Emperor’s cause of death). The ceiling is a replica of the night sky with pearls to simulate stars and the moon. The whole tomb was lit using fish oil lamps which the Chinese believed would burn in perpetuity. Naturally the tomb is also said to be full of treasure and it is thought to have never been robbed in the two millenia since the Emperor’s burial. As a grisly sidenote: the Emperor’s concubines were all buried alive in the tomb and the architects and workers were all killed so that no one could know its secrets. There has been great reluctance on the part of the Chinese government to open the tomb. When the terracotta warriors were first uncovered they were decorated with paint but exposure to the elements since then has caused all colour to fade. There is a similar worry that all artifacts in the tomb could be damaged if exposed to the outside world. The mercury is another worry. Soil test from the top of the mound confirm that there are huge quantities of mercury in the tomb, seemingly confirming Sima Qian’s account about the rivers and seas of mercury. As such any expeditions into the tomb would be extremely dangerous from mercury poisoning or booby traps (of which, Sima Qian says, there are many). Nevertheless, archaeological technology is advancing fast that ever these days and currently ideas for remote controlled robots are being debated. However, it doesn’t look like there will be any expedition into this marvel in the foreseeable future and the Qin Shi Huang can rest undisturbed for a bit longer. It should probably be mentioned that there is said to be a curse on the tomb: that whichever nation opens it, their regime will fall. This is hardly an incentive for the Chinese government to authorize an archaeological expedition into the tomb.